I’ll pay you at least $25 each for the worst fixtures you have. And I’ll replace them with the best and last faucet you’ll ever need. Perhaps I have. But let me start by saying you have a lovely home. How do I know? Because I only sent this letter to people whose homes are what I call “outstanding.” I chose certain neighborhoods with certain architecture and charm. I know your area, and love it. If you look around your home as if you were a guest, you might agree. Your beautiful home deserves equally beautiful fixtures. Fixtures are a very important part of the character and quality of your home. You depend on them to deliver water, without leaks or squeaks. You also don’t want a “cheap” look or feel. So I’m offering to rid you of those old, dated fixtures. (Or like I said, “ugly” is a great excuse, too!) And I want to pay you $25 for the honor. I’ll “trade in” that old beast and put in the finest – and I mean it – the finest faucet you’ll ever own. We’ve got hundreds of options to choose from, straight from the pages of those high-end home décor magazines. They all carry manufacturer’s warranties: no more drips or eyesores, guaranteed! (My wife found several that she loved. Yep, I gave in, and now we enjoy them daily!) I’m sure that you can find one that’s perfectly YOU. Please call: We’re dying to share the beauty and quality of these fixtures! Remember, we get hundreds of plumbing catalogs; it is our business to know quality. These are the best, and they’re not in the discount stores. Doesn’t your home deserve it? Call to find out more. 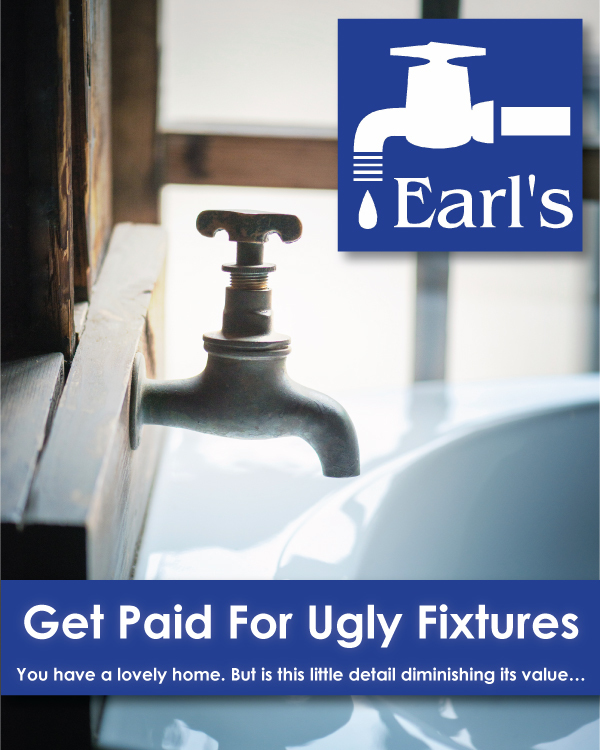 Almost forgot – Your “Stay Happy” Guarantee from Earl’s Plumbing: If in 30 days you decide you prefer your old faucet, we’ll re-install it and give you a 100% refund. We want you to be super-satisfied with your faucets and with Earl’s Plumbing! Just fill out this form online, email us at appointments@earlsplumbing.netor give us a call at (530)343-0330 now for your no-obligation info.